This reading was done for a 23-year-old female who was desiring to know what progress she has made as well as what challenges remain during her healing process of childhood sexual abuse. Her step-father was sentenced to prison over a year ago for the crime. She loves learning about Chakras and being healthier emotionally/physically/spiritually. 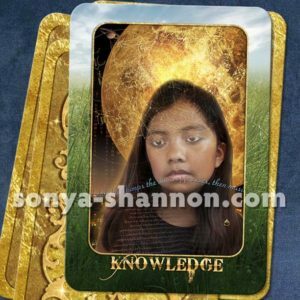 KNOWLEDGE (Air) – She is doing an excellent job of creating more knowledge and awareness of how to feel more grounded and safe on this planet. Her thoughts are still a struggle at times, so continued practice is greatly needed. Saturn (in the top left of the card) is the planet of staying disciplined and being responsible combined with what you have learned over time. So in this reading, my seeker needs to stay disciplined in her self-care and healing and over time, she will gain much wisdom from this experience. It will be challenging for this young woman because staying disciplined is not easy as a trauma survivor. You don’t usually learn quickly from this type of abuse, so she needs to be patient yet vigilant so she doesn’t get lost in past pain or give up any of her wounded inner child pieces to her abuser. Continuing to learn new tools she truly connects with is vital to her healing. Her great wisdom lies in the area of life experience (light and darkness), combined with her deep love for God. Turning her wounds into wisdom will be one of her many gifts to this planet. Many people will praise and be in awe of her. 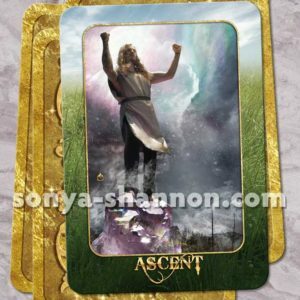 ASCENT (Air) – She is beginning to feel more positive and rising above negative thoughts/beliefs for herself and above her trauma. She is no longer allowing her trauma to define her! I felt her previous shame/guilt as though she was to blame for the abuse, but she is now refining those thoughts/beliefs to be directed to the correct source. Notice the amethyst, the stone he is standing on in the card, showing in the sacral chakra….I would say overall it is protective as well as healing. It helps to transform negativity into love and helps to overcome fears. I also felt she was beginning to view her feminine sexual energy in a more positive light, but may continue to struggle in this area until she meets a man she can trust. Practicing healthy touch with a man, connecting to her inner child, and continuing to nurture healthy thoughts will help her heal those fragmented pieces even more. Going after her passions will help to explode her strengths! 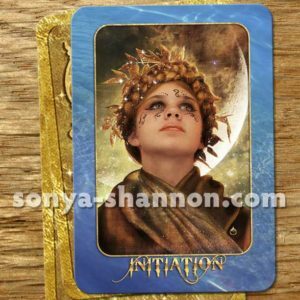 INITIATION (Water) – She is entering a new phase of finding her personal power as well as a deeper level of responsibility to know what is true and to dispel the seed of lies her perpetrator planted. The water will help cleanse her soul of this poison and help her to feel more like a human being rather than a human doing. This phase will take time, faith and dedication. Allowing her feelings to flow and process will help prevent her getting re-triggered and stuck in the pain. 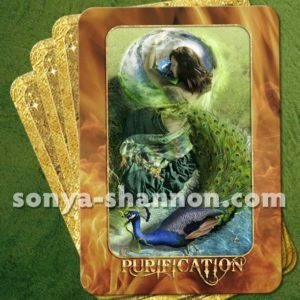 PURIFICATION (Fire) – The snake showing in the Heart Chakra symbolizes the sly ways her abuser injected her with his poison during her vulnerable childhood years to hopefully gain complete control over her (even while he is in prison). Without her seeking help, the abuser hopes the poison will grow like a cancer inside of her and take ultimate control of her. Her heart is being cleansed from the abuse and converted into love, beauty and wisdom. This is helping to ignite her soul and balance out her giving and receiving of love – which heals any kind of wound. She is beginning to see the light in this dark experience and taking action through her self-care. This love renews her overall passion for living! TEMPTATION (Air) – She is beginning to use her voice and speak her truth in so many ways, but she is still fragile and naïve in several areas. She tends to trust a bit too easily without investigating enough and may end up getting hurt again. She validated having previous patterns of moving too fast with men and not using her voice to say what she felt or deserved. Emotional abuse has occurred with other men, so she will have to be careful not to fall into that trap again. Abuse leads to those negative thoughts of herself returning and loss of personal power. She has a very caring heart, but it is vulnerable to those who want to have control over her. Going after what she truly deserves and not being tempted by old patterns will be a huge test for her. 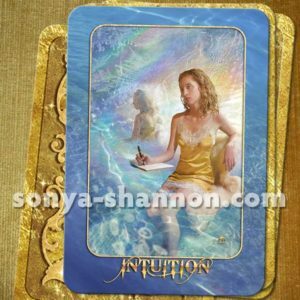 INTUITION (Water) – Her intuition is strong, but sometimes she overlooks what she sees right in front of her as signs to watch out for. She needs to practice being more in tune with listening to promptings from spirit and her inner voice/higher self. Her confidence is building, but this relationship needs to continue to be nurtured. She needs to trust what she sees and feels! 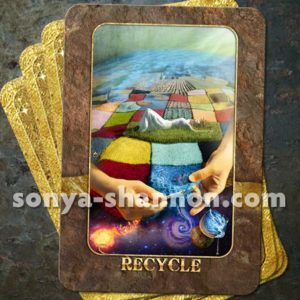 RECYCLE (Earth) – She is beginning to UNDERSTAND and implement what is needed in order to heal her physical body. She is letting go of the very dark/evil pieces of her past and giving it to God. This involves learning to forgive herself and forgive her perpetrator (for her benefit only) and letting God handle her perpetrators punishment. It no longer has a purpose clinging to her anymore. With the guidance from spirit, she is now weaving in the pieces of her story she wants to keep for herself, parts she may want to share with others, and continuing to allow the other pieces to transform!! The young adult female agreed with this interpretation and shared her many areas of growth as well as areas of struggle. 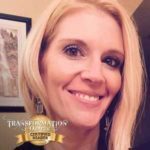 She felt she had more clarity now as to what to focus on and allowed herself to praise how far she has come! She was quite emotional and grateful for the reading.